1 Fill a pot with water and heat on the stove and add onion, celery, carrot, leeks, salt and lemon. Bring it to boil and add prawns, blanching them for 3 mins. Drain the water. 2 Peel the celery and apple and cut into fine slices. 3 Clean and open the lettuce leaves. 4 For the dressing: put the raspberry vinegar, English mustard, salt, pepper, sugar and grapefruit juice into a bowl and mix all together, adding the olive oil gradually. Add the cashew nuts. 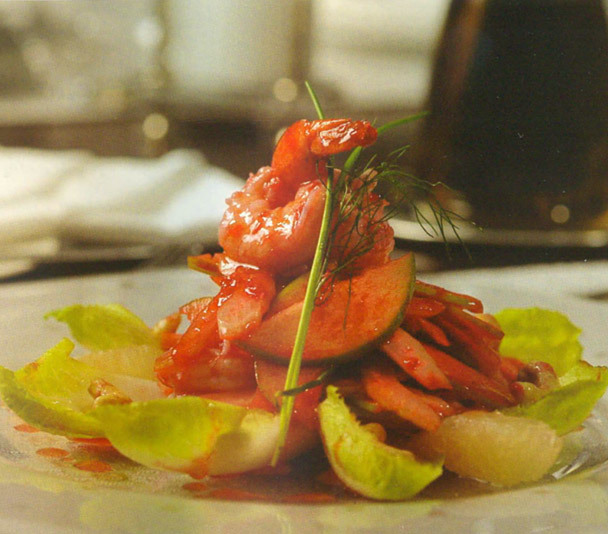 5 To assemble: position all the lettuce leaves like a flower on the plate and pile the celery and apple, as well as the prawn, onion, celery, carrot and leeks mixture into a pyramid shape. Drizzle on the dressing according to taste.